Celebrating over 20 years of service excellence! Professional Warranty Service Corporation (PWSC) is an indispensable risk management partner in the new home construction ecosystem with a relentless focus on integrity, innovation, and customer service. We provide leading risk management solutions, in addition to our comprehensive home warranty products and administration services, to promote homeownership nationwide. PWSC’s builder warranty products include the Signature 10-year insured Builder’s Limited Warranty Program, the Home Builder’s Limited Warranty integrated solution for volume production builders and our HomePRO Systems and Appliance Warranty which provides extended coverage on most major systems and appliances after the manufacturer’s warranties typically expire. Not only are there valuable benefits to adding a warranty to your new home sales offering, but you can instill further confidence in the home buyer and sell homes faster with PWSC’s ancillary services, like our HomeOwner Platform (HOP) which helps reduce warranty calls by providing one virtual location to your homeowners to manage all aspects of their home. Let us work with you to integrate the warranty into your sales process, marketing and legal documentation. Learn more about our services and how we partner with our builders. PWSC is all about superior protection, whether it’s a PWSC-administered structural warranty from your builder or a systems and appliance warranty on a newly constructed or “new to you” home. Learn more about how we work. 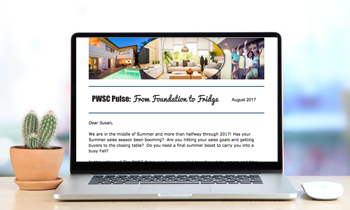 With PWSC residential home warranty solutions, real estate professionals can sell resale and new homes faster. Build a relationship with warranty experts you can trust. Take a look at how we can help.